Hi guys! I saw this event in Facebook and wanted to share this opportunity for you and your familia to enjoy a free concert from Brownout, a hugely popular Latino band from Austin! 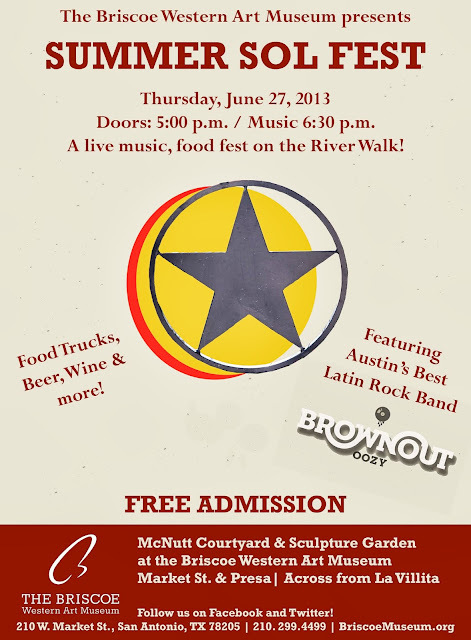 The first annual Summer Sol Fest will be held on the grounds of The Briscoe Western Art Museum this Thursday, June 27th at 6:30 pm. Free music, food trucks will be in attendance and you get the chance to see the Briscoe campus before it's Grand Opening! FYI, the Western Art Museum will be open this fall! More details on the flyer above and at their website www.briscoemuseum.org.